Multiple images of a distant quasar are visible in this combined view from NASA’s Chandra X-ray Observatory and the Hubble Space Telescope. The Chandra data, along with data from ESA’s XMM-Newton, were used to directly measure the spin of the supermassive black hole powering this quasar. This is the most distant black hole where such a measurement has been made, as reported in our press release. The quasar is known as RX J1131-1231 (RX J1131 for short), located about 6 billion light years from Earth. Using the gravitational lens, a high quality X-ray spectrum – that is, the amount of X-rays seen at different energies – of RX J1131 was obtained. It is known that black holes launch relativistic jets both in stellar-mass binary systems and at the centres of galaxies, in the so-called ‘quasars’. Although jets have been studied for decades, their composition has remained uncertain. Now, a work, published on Nature and led by researchers from the University of Barcelona, the German headquarters of the European Southern Observatory (ESO) and Curtin University (Australia), presents the detection of atomic nuclei in the relativistic jets from the black hole binary system 4U 1630-47. “In this work, we have found the composition of relativistic jets launched from around black holes; however, more studies are needed to understand if results can be extrapolated to other relativistic jet sources”, explains Simone Migliari, from the Institute of Sciences of the Cosmos of the UB (ICCUB). According to the researcher, the research proves that relativistic jets might be ‘heavy jets’ containing atomic nuclei, rather than ‘light jets’ consisting of electrons and positrons only”. “The finding —he adds— implies that ‘heavy jets’ carry away significantly more energy from the black hole than ‘lighter’ ones”. Like our Milky Way, every known large galaxy has at its center a supermassive black hole, some of which are surrounded by a super-bright disk of hot gas called a quasar — but now a research team that includes Penn State astronomers has discovered a surprising new class of quasars in distant galaxies that even the most current theories had not predicted. “The gas in this new type of quasar is moving in two directions: some is moving toward Earth but most of it is moving at high velocities away from us, possibly toward the quasar’s black hole,” said study co-author Niel Brandt, Distinguished Professor of Astronomy and Astrophysics at Penn State University. “Just as you can use the Doppler shift for sound to tell if an airplane is moving away from you or toward you, we used the Doppler shift for light to tell whether the gas in these quasars is moving away from Earth or toward these distant black holes, which have a mass from millions to billions of times that of the Sun.” Brandt explained. Matter around these black holes forms a quasar disc that is bigger than Earth’s orbit around the Sun and hotter than the surface of the Sun. These quasars generate enough light to be seen across the observable universe. Astronomers have detected cold streams of primordial hydrogen, vestigial matter left over from the Big Bang, fueling a distant star-forming galaxy in the early Universe. Profuse flows of gas onto galaxies are believed to be crucial for explaining an era 10 billion years ago, when galaxies were copiously forming stars. To make this discovery, the astronomers – led by Neil Crighton of the Max Planck Institute for Astronomy and Swinburne University – made use of a cosmic coincidence: a bright, distant quasar acting as a “cosmic lighthouse” illuminates the gas flow from behind. The results were published October 2 in the Astrophysical Journal Letters. The systematic survey of absorption systems comprises observations with the Large Binocular Telescope and from data taken with the W. M. Keck Observatory’s HIRES echelle spectrograph installed on the 10 meter Keck I telescope on the summit of Mauna Kea, Hawaii. 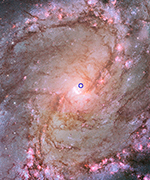 The foreground galaxy was discovered by Charles Steidel, Gwen Rudie (California Institute of Technology) and collaborators using the Keck Observatory’s LRIS spectrograph on the same telescope.